This function allows ther users to enrol/drop student to/from their class in batch. This section is to Create a new Student Block. To Update Student Block, refer to title Update Student Block. Navigate to Main Menu > Records and Enrollment > Enroll Students > Block Enrollment > Create Student Block. User will be directed to Create Student Block page. Enter the group of students’ Student Enrollment Block (Class Name). User will be directed to Block Enrollment Students page. Enter the Description for Student Enrollment Block. Select and enter the ID and Academic Career of the group of students which the user wish to enrol into the block. The students’ ID can be found in the Summary page of the .log file from Upload Student Application section. Click on the “+” icon to add more students. When all students have been added in, click on the Save button. This section is to Create a new Class Block. Go to the "Find an Existing Value" tab. 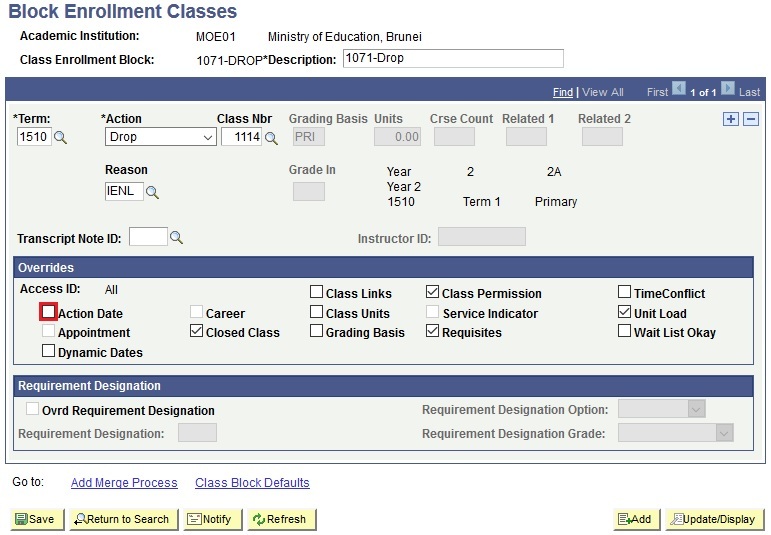 Enter the existing Class Enrollment Block and click Search button. User will be directed to Block Enrollment Classes page. Click on the '+' button to add more classes. To proceed, follow from the step number 8 in this section. Navigate to Main Menu > Records and Enrollment > Enroll Students > Block Enrollment > Create Class Block. User will be directed to Create Class Block page. Enter the group of students’ Class Enrollment Block. User will be directed to the Block Enrollment Classes page. Enter the Class Enrollment Block Description. Ensure Action is set as “Enroll” to enroll student into class. Click on the look-up button of the Class Nbr. User will be directed to Search Block Enrollment Classes page. Click on the dropdown list and select the Course Subject. Click on the dropdown list and select the Course Career. Click on Additional Search Criteria arrow button. Click on the dropdown list and select the Campus. User will be directed to the Search Result page. Click on the Select Class button to the right of the Class Section the user wish to enrol the group of students into. User will be directed back to the Block Enrollment Classes page. Ensure Closed Class, Class Permission, Requisites and Unit Load checkboxes are ticked. Check the Action Date box. Click the Calendar icon and select the Action Date. Note: Action Date is the date when the student enter the school. Click on the “+” icon to enrol the group of students into more classes. Repeat step 8 – 22. Ensure class schedule does not clash. When user is done with selecting the classes, click on the Save button. Navigate to Main Menu > Records and Enrollment > Enroll Students > Block Enrollment > Block Enroll Merge. User will be directed to Block Enroll Merge page. Enter the corresponding Student Block and Class Block. into the respective field. Click on the Merge button to combine student block and class block. Click on the Submit button to enrol student into classes as assigned in Class Block. Ensure that the Request Status changes from Pending to Success/Error. Click on the Retrieve button to view status of student enrolment into classes. User will be directed to the Block Enroll Detail page where it shows the list of students and the classes they were successfully enrolled into. Click on the Detail link to the most right of the student’s name to view class details. User will be directed to the Block Enrl Detail1 page and user will be able to verify the class details and Messages if any errors. To view the other student details, go back to the Block Enroll Detail page by clicking on the Block Enroll Detail tab. Repeat step 10 – 12. Navigate to Main Menu > Curriculum Management > Class Roster > Class Roster. Note: The class number can be found in the Block Enrollment Classes page. This steps is only done if entire student from a selected class has been enrolled to the wrong class. For example, student from class 2A has been enrolled to class 3B. Those 2A students need to be remove from the 3B class. Thus a Class Block for dropping the students from 3B class need to be created. Click on the dropdown list and select *Action as “Drop”. Enter the Class Nbr the user wish to drop the batch of students from. If user do not know the Class Nbr, click on the lookup button to search for the class and follow the procedure from Create Class Block section step 10-19. Click on the lookup button and select the Reason for drop action. If user cannot see the drop reason, click on Save button first then click on the lookup button to select the Reason. Enter the Action Date as of when student drop from class. Click on the “+” button if user wish to add more classes to drop from for the same batch of students. Make sure to Merge the correct Blocks. For example, student from class 2A need to be drop from class 3B. Hence, a drop Class Block containing 3B class nbr need to be created. To Merge the blocks, use Existing 2A Student Block, and merge it with the created Drop Class Block. Enter the corresponding Student Block and Class Block into the respective field. Click on the Submit button to drop student out of classes. Click on the Retrieve button to view status of student enrollment. User will be directed to the Block Enroll Detail page where it shows the list of students and the classes they were successfully dropped out of. User will be directed to the Block Enrl Detail1 page and user will be able to verify the class details and Messages if any. Verify the class roster by following the procedure from Verify Class Roster section. In the Find an Existing Value page, enter the existing Student Enrollment Block. Click on the “+” icon to add more student. Enter the student ID and Academic Career of the student which the user wish to enrol into the block. Click on the “-“ icon to delete student. Click on the OK button to delete the student, or Cancel button to cancel deleting the student. When the student list have been updated, click on the Save button.